The Time to Write is Here Again! I have been feeling the itch to put words on paper with the next book in the series; tentatively named A New World: Sanctuary. The story runs through my mind, shifting and turning about. I am sitting here enjoying a fresh Hef, to be complete with Nachos here shortly, and hashing through the plot line as we speak. Or as I write this. The plot line is mostly complete but the events have to be set in order. Of course, as with the other books, they tend to write themselves once I get started and I am only the conduit through which they tell themselves. Earlier, under the effects of a quad shot, I hashed out a bit of the series overall. I have to tell you that, without really looking in detail at each book, that the overall story may take 9 or 10 books to tell. Of course, that was the caffeine coursing through. I am excited to continue with this next book and the ones to follow. I will be deeply immersed in the next book by this weekend having put the plot line together. That plot line is subject to change with the first word on the screen. Okay, nachos are here. Time to put the pad and keyboard down. First though, I want to thank all of the readers so much! You have been wonderful with your comments and support. I wish everyone a happy Wednesday evening! This entry was posted in IndieHorror and tagged A new world: chaos, A New World: Return, A New World: Sanctuary, adventure, apocalypse, book, horror, mutant, new book, Thriller, virus, world ending, writing, zombie on September 28, 2011 by John O'Brien. Happy Monday everyone! I hope the weekend went well and the injuries have healed 🙂 I want to take a little different track today and talk about dreams. Or, more specifically, someone to help with dream interpretation. My mother, June O’Brien recently retired from the working community where she worked with and ran drug and alcohol treatment centers; also conducting reviews and studies for others around the world. A tremendously intelligent and wise woman – no bias here:) Along her journey, she became very immersed and knowledgeable with dreams and dream interpretation. There are those, including local tribal leaders and medicine men, who seek her out to talk about their dreams. I wish everyone a very happy day and hope that your dreams come true! This entry was posted in IndieHorror, Thought of the moment, Uncategorized on September 26, 2011 by John O'Brien. I sat down and basically did nothing for the past couple of days after getting A New World: Return out. I had to rest my weary and aching mind – yes, I might like some cheese with that. But, now it is back to work. First on the agenda is to get A New World: Chaos and A New World: Return formatted into paperback editions and get them out. That should not take too long to get them formatted as I have the previous rough draft already done. It is just a matter of copying the latest versions and getting the page count right. The timely aspect will be receiving the books to review and giving the okay for print publication. That may take a couple of weeks at least to accomplish. In the meantime, a touch of my time will be spent on some marketing and putting together a clean outline for the next book which is tentatively set to be called A New World: Sanctuary. Response has been great on the first books in the series so far and I want to thank you all for your support. Makes me happy that you are enjoying them. A timeline for the next book you ask? Well that is really hard to say. The writing on the second book took off after the first 20,000 words and I was getting in anywhere from 5,000 to 10,000 words a day. 10,000 was a top day and averaged really from 5,000 – 8,000. I don’t know if this next one will flow like that but I am hoping so once I get the plot and plot lines figured out. I send the very best wishes to everyone on this gorgeous Saturday! This entry was posted in IndieHorror on September 24, 2011 by John O'Brien. The editing for A New World: Return is finally finished. Yay! That was a mind numbing week to finish in time. The book has been submitted to Amazon but the author name came out incorrect so I will have to republish it once it gets out of the review process. The book will still be available however. I also submitted to Smashwords and is up and running there. I expect the approval to come soon for the expanded distribution making it available to Barnes & Noble, Sony, iTunes, and the other eBook distribution sites within the next couple of weeks. I really enjoyed writing this second book in the series, sans the editing process, and I truly hope you enjoy this next set of adventures for Jack and his group. Next on the agenda is to format A New World: Chaos and A New World: Return into paperback versions and publish. I am hoping to have those out by the end of October. Then it is on to the third book which I am tentatively planning on naming A New World: Sanctuary. I hope everyone has a tremendous day! This entry was posted in IndieHorror and tagged A New World: Return, adventure, apocalypse, book, horror, mutant, new book, Thriller, virus, world ending, writing, zombie on September 22, 2011 by John O'Brien. 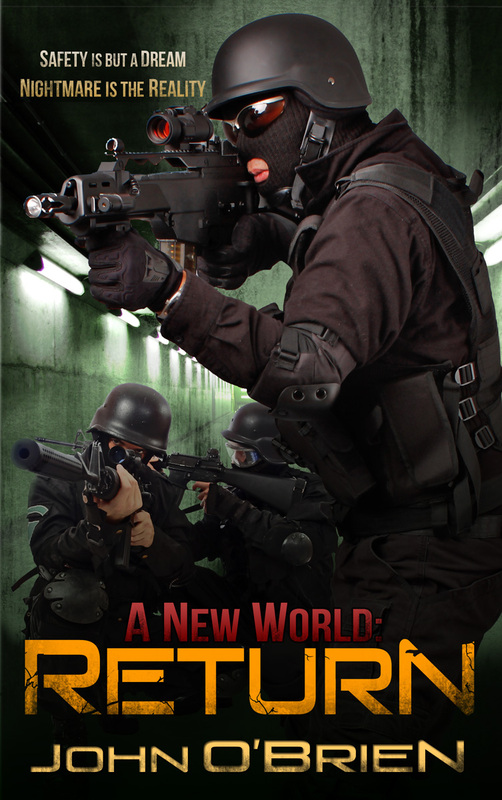 The date for the second book in the series, A New World is set for 23 September, 2011. A New World: Return will be available on this date in eBook format for Amazon and Smashwords with the book becoming available at Barnes & Noble, Sony, iTunes, Diesel, and Kobe in the following weeks as it propagates out to them. The first book, A New World: Chaos will continue to be on sale for $2.99 through the rest of September. I want to thank everyone for the great reviews and for supporting my Indie endeavor. The sales for the first book have exceeded any expectations I have had and it is truly my hope that everyone who has read it enjoyed it. I am really enjoying writing this series and it makes me happy to think that you are enjoying the book. I hope that you enjoy the second book as much. Off to finish the editing and I wish everyone a great Friday! This entry was posted in IndieHorror and tagged A new world: chaos, A New World: Return, adventure, apocalypse, book, horror, mutant, new book, Thriller, virus, world ending, writing, zombie on September 16, 2011 by John O'Brien. First, Happy Monday to everyone! The book sales on the first book, A New World: Chaos have skyrocketed in the past two weeks. I would like to thank everyone for supporting my endeavor. I have completed the second book, A New World: Return. I have the book back from the editor and am now going through those edits. I may have to change the publication date for this book for several reasons. One is that JL Bourne is releasing his third book on September 27th and I don’t want to step on his opening. Another is that I may not be able to make the edits in time to get the book out before his release thereby pushing the publication date out to October. The learning experience from publishing the first book makes me want to put out a finely-tuned, edited edition the first time. I found several mistakes in the first book and had to republish that one. Now, for the great news and one other reason the second book may be pushed back. I have been contacted by Permuted Press and offered a publishing deal for the first three books in A New World. I don’t know what this means for the current publication nor for the second book’s publication date as yet. I don’t know whether to take the deal or not as yet as I do like retaining the rights for my babies – yes, that is how I think of them. If anyone has any opinions or experiences with the Indie versus traditional publishing, I would certainly enjoy hearing from you. I am stuck on the royalty, book momentum, and rights aspects. Overall though, I am ecstatic over the deal and feel very privileged to be contacted and offered a deal. It makes me feel good about the book and that the readers are enjoying it. This entry was posted in IndieHorror on September 12, 2011 by John O'Brien. The new cover art by SM Reine arrived last night. 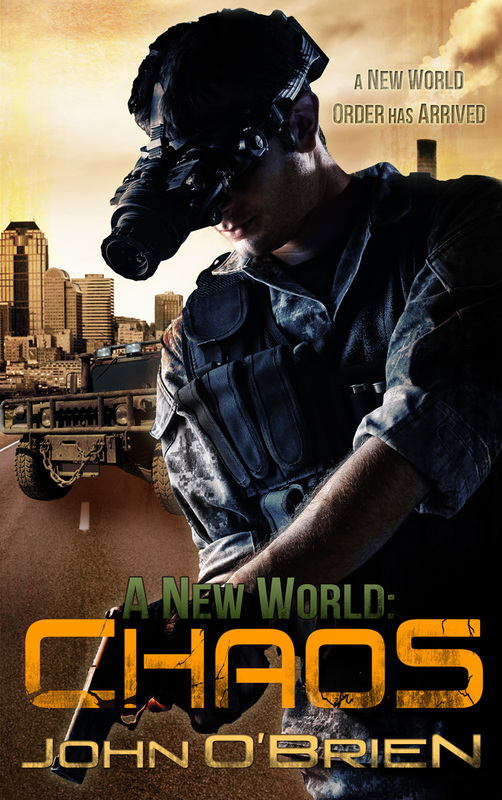 I loaded up the new cover art for A New World: Chaos late last night to Amazon and Smashwords. I am still waiting for A New World: Return to get back from the editor and then it is announcement and publication date. For those of you looking for a cover artist, seriously check into SM Reine. Off to the editing world for a little while. I wish everyone a very happy Tuesday! This entry was posted in IndieHorror on September 6, 2011 by John O'Brien.